How To Create Sticky Floating Bar Fixed at top in blogger blogs? Home Blogging Design Hack How-To Widgets How To Create Sticky Floating Bar Fixed at top in blogger blogs? We have created this Sticky Floating bar with toggle feature where your users can show or hide this sticky bar according to their desire. 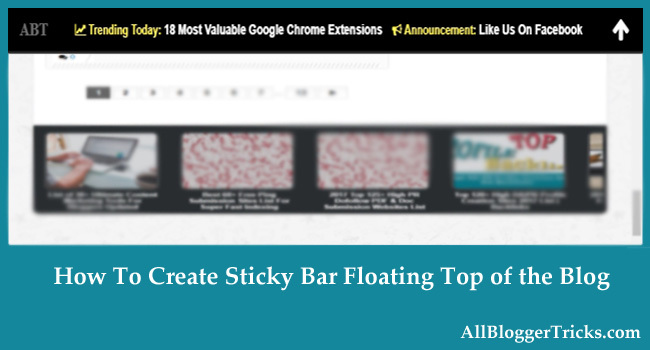 Floating Sticky Bar is is recommended because this sticky widget will be at fixed position at the top of your blog where this widget will get maximum exposure. Like we said above you can show so many things inside this sticky bar. This widget will be full width and has a hide and show feature called toggle. Using this widget you can increase your pageviews. You can take users to your most important post or page. We have added toggle button at the right side of the widget so that users can hide and show the fixed floating bar based on their choice. When visitors clicked on UP Arrow the widget will hide and instantly the down arrow will appear and when click on it the widget will display again. The Design is cool and theme used is dark to bring the premium look to the widget. This theme looks good in light theme blog and dark themes blogs as well. You can customized the colors with few tweaks and can add your favorite colors that match your blog theme. We know some of you are still not familiar with the codes in the blog templates and don't want to their hand to get dirty. So we have made this widget easy to install. you can add this widget like you add blogger third party widgets from the layout section. We Checked in Many Templates This Widget Works Very Smoothly and loads very fast. If you have already added Font-awesome link and JQuery script in your blog then don't add this two scripts highlighted in orange color. The Orange Highlighted Text is responsible for Font-awesome Style-sheet and Jquery Scripts if you already included this style-sheet and script in your blog template then please don't add this both in your blog . The Green Highlighted Text is Responsible for Background Color of the Floating Sticky bar and toggle button. Replace this with your desired color to change the theme. The Light-blue Highlighted Text is Responsible For Font Color or Text Color of the Floating Sticky bar change this to your desired color. The Lightblue Highlighted Text is Responsible For The Link to your desired post or page. The Red Color Text is Responsible for The Link Anchor Text. Yo can add more links in the Sticky bar if you want to add more links then add this code after the end of </a>. You also can add your own section by removing our default section. We finally added the widget now its time to check and edit the widget according to the need. If you are confused in add links or separate section the comment below we will help you. That's It Thanks For Following our Tutorial '' How To Create Sticky Floating Bar Fixed at top in blogger blogs? '' Along With us If you found any difficulty Please Comment and Share Your Valuable Opinion. And Stay tuned for More Tutorials Like This and Share this with your friends. There is something I would like to ask and hope you'd answer. I have added this to my blog but the floating bar covers my site's top menu. Is there a way to toggle this widget to push the webpage below it? So it would not cover my top menu? Hello What you need to do is get the id of the top menu and just add margin-top: 60px hope this will solve the problem.